These are one of the most amazing composting worms that I have ever seen. They breed faster than red worms and grow bigger than European Night Crawlers. The only downside is that they cannot tolerate the cold. 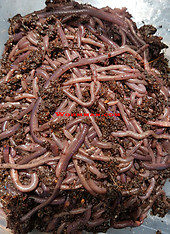 If you are looking for worm castings, bait or a good breeding worm these are for you. Just keep them indoors. They can tolerate temps that drop near freezing but stop breeding when the temps hit the 50's. They do very well in hot climates and will do very well in cold climates if kept indoors. We make tons of castings with African Night crawlers. They are the best worm if you can keep them out of the cold.